This article is the first part on a series of how to make model buildings for the 1808-1809 Russo-Swedish war. The first two articles consist of pictures of old buildings that have survived to this day. The purpose is not to make exact scale models, but some passable model buildings that look good on the gaming table. 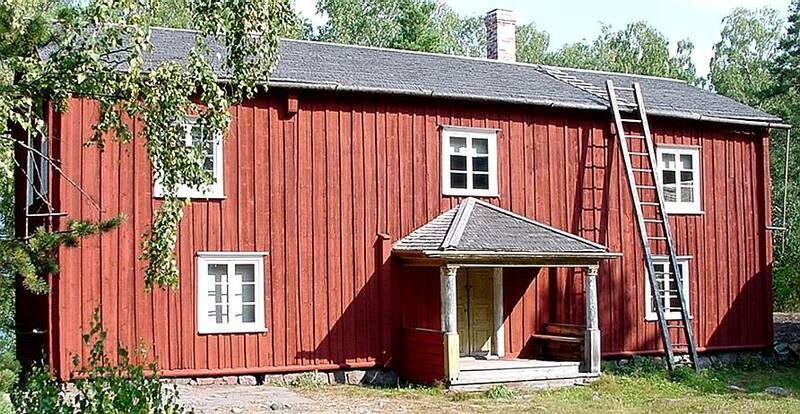 As the building style varied in different parts of Finland and also over time, the pictures state the construction year and roughly from which part of the Finland it originates (like Western, Eastern (Karelia), Central or Southern Finland). 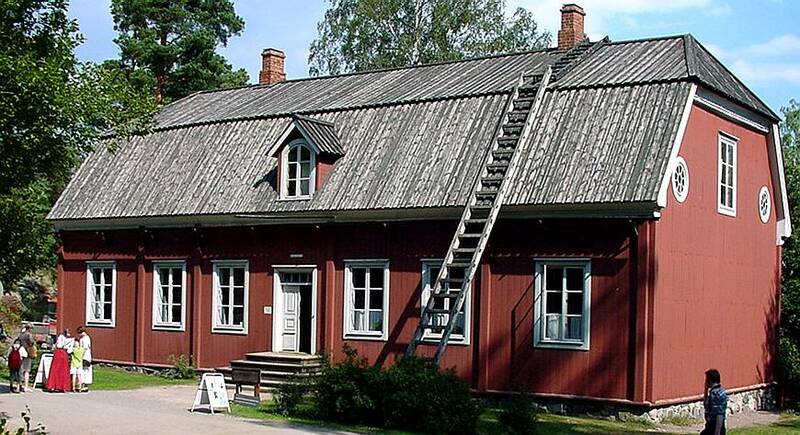 The building below is a vicarage from Eastern Finland, 1797. The place needed to be at least a town size for the clergyman’s quarters to be this luxurious. Walls are covered with lumber paneling, painted red. Window frames are white. Each window consists typically of 4 or 6 smaller panes as manufacturing full size panes was difficult/expensive. As a decorative detail, there are round windows at the end of the building – otherwise there are scarcely windows on the 2nd floor. The porch is not covered – there could be a closed space porch just as well. The roof has more shapes than would be typical for most buildings. Covering the roof with full length tar treated lumber was quite standard, though. The walls could also be yellow. Some wealthier households could afford and preferred yellow coloring. See the Church of Oravainen article for reference on the tone of the yellow. Red was definitely the most common and cheapest color – if paint was used at all (see examples below). Here are three examples of common man’s houses. 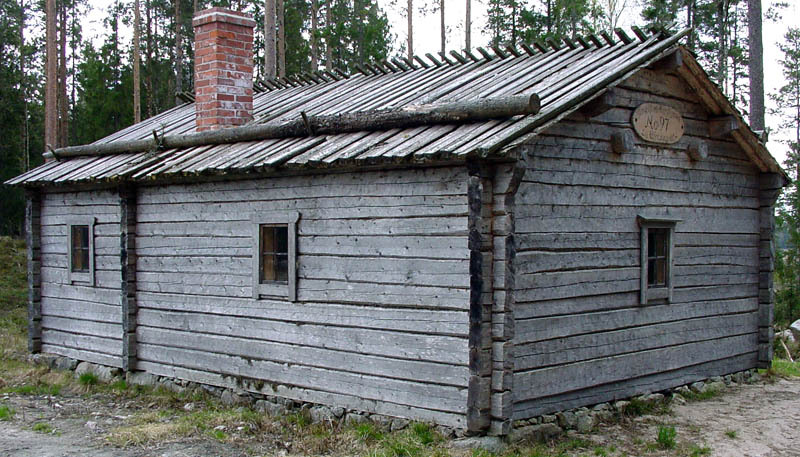 The first is from the Eastern Finland (Karelia), 1820-1825. The style and construction method is very simplistic – round, untreated logs with very few and small windows. 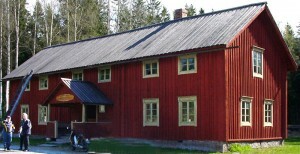 Shingle-roof with logs as weight. Even the chimney is not made of bricks, but stones & clay. 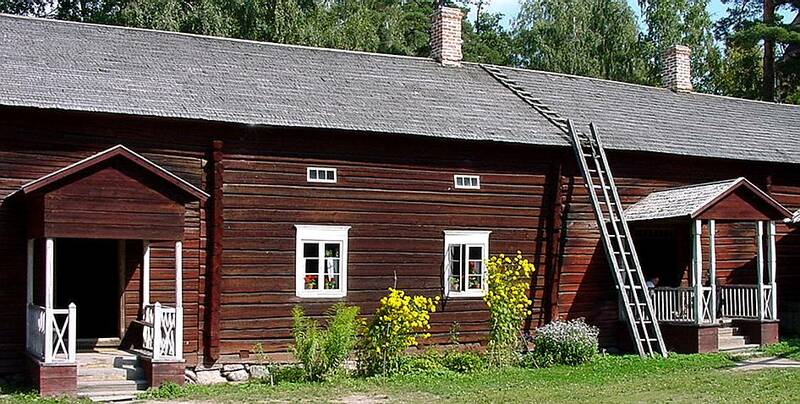 Houses in the other parts of Finland could be of this simple design as well, but would usually have at least bigger windows to allow more light in the house. Windows do have class panes as the climate doesn’t favor open holes in the walls. The second one is from the Eastern Finland, 1842. Single storey house with shingle-roof. The walls have not been painted, but the time has patinated them with brown hues. Also the window frames have been left unpainted – only the thin strips holding the actual window panes have been painted white, but probably that was done at much later date. 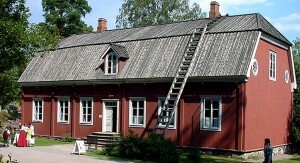 This last example could be found from any part of Finland – the 2nd storey could be lower, which would show as the windows not being full height, but just 1/3 of the shown. This particular one is from the Western Finland, 1764. There’s always a log frame that makes up the walls. To improve the energy efficiency the building could be covered with vertical lumber paneling right away or some years/decades later. 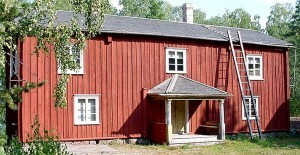 Set of buildings from Western Finland, 1820’s. Living quarters, storage and animal sheds were arranged into a closed courtyard to keep the wildlife outside. Two or more related families and hirelings would live within the premises. Below is the living quarters. Log buildings painted red, shingle-roof. Two entrances so that two households can live seemingly independently. The utility sheds were made of untreated logs or lumber with different kinds of roofs. Shingles, straws or lumber as in the example below. The gaps between buildings were closed with fences. The sheds usually didn’t have any windows, just ventilation shafts that could be closed. Any required light would come through the open door or from an oil-lamp/candle. 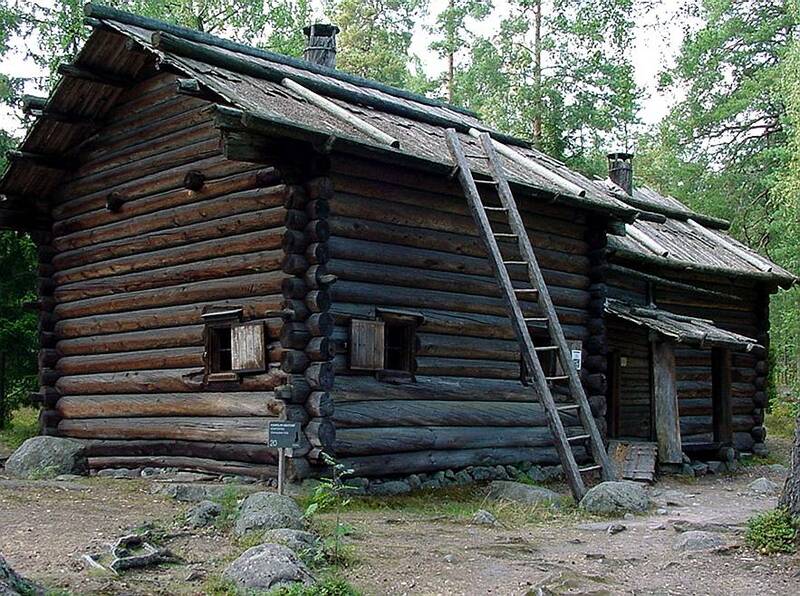 The land unit system used to provide an army in Finland also provided the soldiers – well, officers anyway – housing for them and their families. The above is from 1733 but was well in use still in 1809. Today it’s a museum. The building frame is made of logs, which have been covered with vertical wood paneling. The building stands firmly on a stone base, which is ventilated and keeps the building dry. 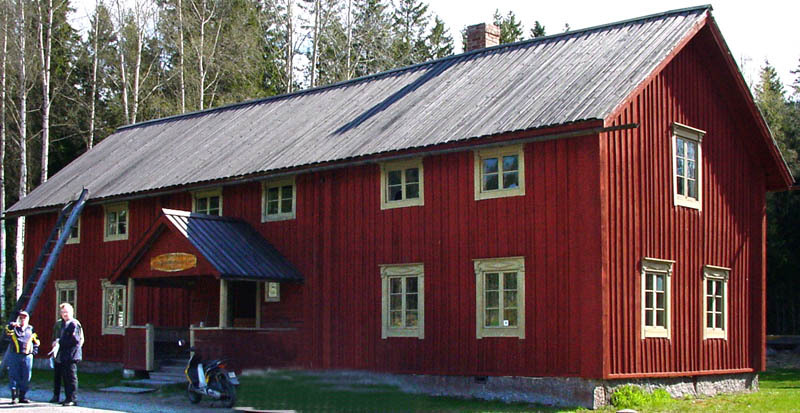 The roof is made of full length lumber, which has been treated with tar. When painting a model building roof, add a hint of brown to the black as tar really is dark brown. This second example is of a typical building for lower rank officers and their families. This particular building is newly build, only a couple of years old. As we can see, the untreated wood turns grey relatively fast, so only really new buildings would be wood color (light brown).